Our product range includes a wide range of water bottle filling machines and water bottle filling machine. We are actively devoted to manufacturing, distributing and supplying of a quality approved Water Bottle Filling Machine. Our offered bottle filling machine is fully-automatic bottling line for juices, drinking waters, and liquids. The provided bottle filling machine is accurate and high-speed production machines to pack drinking water in pet bottles. In addition to this, provided bottle filling machine is widely appreciated in the market owing to its quality and flawlessness. Our company is offering the range of Water Bottle Filling Machine. These Water Bottling Machine are developed and designed by the leading industry experts and are quality tested according to the latest market parameters. These are available in various specifications and ranges. Neelkanth Packaging Machinery is known in the market for liquid filling and packaging machines for industries like Food & Beverages, Oil, Agrochemicals. We manufacture Automatic Rinsing Filling Capping Machine, Semi-Automatic filling machine, Air Conveyor, Discharge Conveyor, Auto Sleeve Labeling Machine, Automatic BOPP Labeling, Automatic Web Sealer, etc. RFC Machine Series is based on fully automatic process like Bottle Rinsing, Filling, Capping Machine etc. This machine equipped with man-machine technology with all automation. 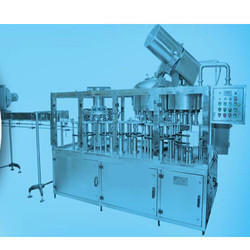 Mainly used for washing, filling and capping, etc.